Ierimonti Gallery is pleased to present Binary Operations, the first solo exhibition for artists Pekka and Teija Isorättyä in NYC (April 5 – May 18, 2018). Binary Operations includes recent kinetic sculptures that represent the artists’ longstanding inter- est in the re-use of found materials. This harkens back to the kinetic art pioneer Jean Tinguely and the ever-relevant Marcel Duchamp, as well as their own dedication not only to the recycling of materials, but a transcendent transformation of their past use. In this exhibition the materials re- born in the interactive sculptures are surgical instruments, lenses from theater lights and mirrors, each with their own rich histories. The machine sculptures are complemented by a haunting soundtrack that echoes the sound of the activity of the instruments layering and reverberating upon themselves and mixing their own current present and past in the gallery space. 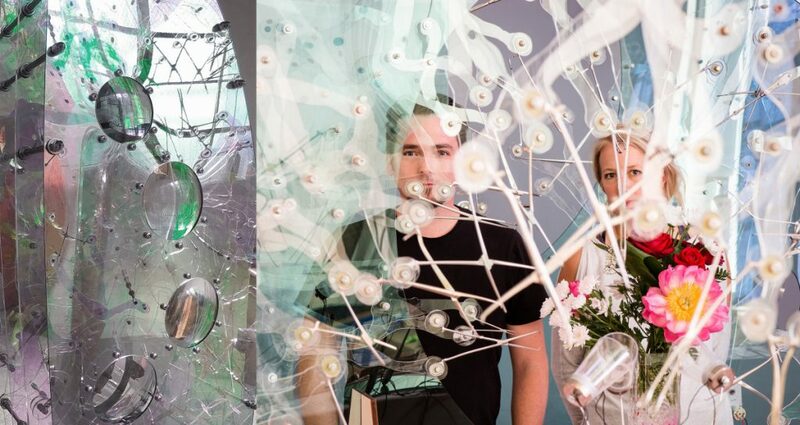 The Isorättyä’s kinetic and electromechanical sculptures explore a speculative future of increased interface between man, machine, and nature. Likewise, the artists mine these topics in order to reference the incoming second “machine age,” where digital technologies increasingly compensa- te for human limitations and workforce.”Abstract and interactive, the robotic sculptures employ a formal elegance with mechanized complications. The sculptures highlight the stunning precision of the mechanical world, as well as a suggestion of the unknown forever intertwined with an ambiguous future. The fragmented mirrors and gears draw attention to our own self-awareness about the nature of man and machine, and provoke viewers to contemplate the contemporary interpretations of that notion.